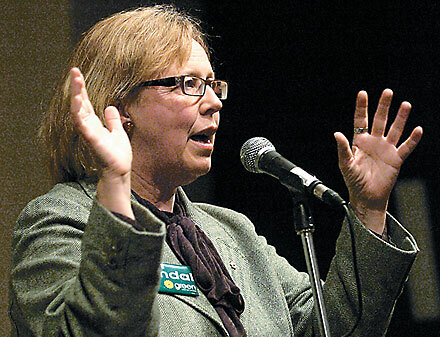 Federal Green Party leader Elizabeth May dropped by Toronto Centre to promote local byelection candidate Chris Tindal at an election rally Thursday night. Dozens of Green supporters turned out to the rally, at the Pantages Hotel and Spa, cheering on party luminaries such as May, Tindal and Willowdale byelection candidate Lou Carcasole. May spoke highly of Tindal and his role within the Green Party. As a second-time candidate, and one who increased party support greatly during his last campaign, Tindal is a member of May’s shadow cabinet as the Green Party’s democratic reform critic. May said Tindal’s integrity and decency made him an ideal representative of the Green Party, taking a swipe at the Conservatives by noting that the Greens were happy to have their candidates speak out on issues in their own words. She warned that the budget does little to address pressing issues such as the environment in favour of more so-called security measures. “There will be more policing along polluted waterways, not cleaning it up,” she said. Former Green Party leader Jim Harris addressed the assembled Green supporters by noting that the party has grown from roughly 700 members in 2003 to over 10,000 members across Canada today. He added that the budget Tindal’s campaign in Toronto Centre was more that twice as large as the entire Green Party’s federal campaign budget in 2004. Tindal added that support in the riding has been far greater than ever before and, though he offered a tip of the cap to his high-profile Liberal opponent Bob Rae, he said he has noticed a desire for change in the riding. The byelection will take place on Monday, March 17. No, change for the sake of the country. Change because we cannot afford to continue to go down the same path using the same line of reasoning that created the climate crisis, the credit crisis, the housing crisis, etc. The kind of thinking that got us into these problems cannot get us out of them. The Green Party has creative new ideas to tackle each of these crises and turn them into opportunities (as articulated throughout this website and in Vision Green), and it’s time those ideas were heard in Parliament.